Russell Westbrook is on pace to average a triple-double for the third straight season but will his jump shot hurt the Thunder in the race for the Western Conference crown? Russell Westbrook looked destined to take a back seat in Oklahoma City through much of 2018-19, firmly entrenched in a secondary scoring role behind Paul George. The Thunder’s offensive inversion from year one of the arranged marriage made sense. George was entrenched as a legitimate MVP threat through the first two thirds of the season, while Westbrook worked through a disastrous shooting stretch. Oklahoma City’s nominal alpha dog morphed from headliner to elevated sidekick. Circumstances have changed in the past month. A hurt shoulder caused George to miss three games as the calendar turned to March. His production has dipped since. George is averaging to 25.1 points per game in his last nine contests, down from 28.8 in his first 59 games. George is making just 32.8% from three since March 1, tallying just 34 assists as he’s coughed-up 30 turnovers. Perhaps its fatigue before the postseason, but George’s dampened production created a vacuum in the Thunder’s offense. Naturally, Westbrook has assumed a greater role, and the results have been better than expected after his troubling first four months. George and Westbrook have shifted back to a more sustainable offensive equilibrium, and the balanced usage should pay dividends as we approach the postseason. Westbrook has largely looked like his MVP self since Feb. 1. He’s averaging 26.3 ponts, 11.5 rebounds and 9.5 assists over the last 21 games, canning 2.4 threes per game on just over seven attempts. Westbrook isn’t setting the world on fire from beyond the arc. In fact, he still checks in below league average at 33.9%. But the jumper has been passable of late, a significant progression from his horrendous start. Westbrook shot just 25% from three before February. Of the 134 players to attempt at least 150 threes through January, Westbrook ranked 133rd by percentage, ahead of only Trey Lyles. Over the past two months, however, Westbrook is shooting the same percentage from three as James Harden. His historic cold streak to start the year has thawed in 2019. It’s a testament to Westbrook’s immense skill that he remains an All-NBA player despite such an unstable jumper. Westbrook shot under 30% from three in four of the last five years. He shot 34.3% from beyond the arc in his 2016-17 MVP season, but the 82-game sample increasingly looks like an aberration. Westbrook is on pace to average a triple-double for the third-straight season with a subpar jumper, a feat that feels counterintuitive amid the league’s three-point revolution. Westbrook’s poor percentages aren’t necessarily crippling to the Thunder’s success. Oklahoma City still cruised past much of the West before the All-Star break, sitting two back of Denver for the No. 2 seed at 37–20. The Westbrook-George-Steven Adams trio blitzed teams with a plus-9.5 net rating, scoring 112.8 per 100 possessions. George’s dominance was partly responsible for the success, though Westbrook’s evolution formed an increasingly efficient partnership. Westbrook avoided his worst perimeter impulses early in the year, cutting down the early-shot clock heaves and transition pull-ups. Even though a touch of explosion may be gone compared to his MVP days, Westbrook is still an electric finisher, and a canny interior passer. The rest of his game shined as his jumper clouded the box score. Adams feasted on dump-offs, and Jerami Grant skied for lobs. George earned plenty of open jumpers, looking far more comfortable in year two of Oklahoma City’s post-Durant partnership. Even in the midst of a horrible shooting slump, Westbrook remained effective. He attempted just 4.7 threes per game in his first 40 games as Oklahoma City went 32–18. His attempts have ballooned to 7.3 per game since Feb. 1, a 22-game stretch in which the Thunder have gone 10–12. Westbrook’s inefficiency isn’t necessarily a problem. The issue is the volume. The Thunder’s Game 6 loss to the Jazz last year is widely remembered for Paul George’s temporary entrance into the witness protection program. Playoff P went just 2-16 from the field in the 96-91 loss, delivering perhaps his worst performance of the season as Utah steamrolled its way to the West semifinals. And while George can’t escape a large share of the blame, Westbrook shouldn’t given a free pass, either. 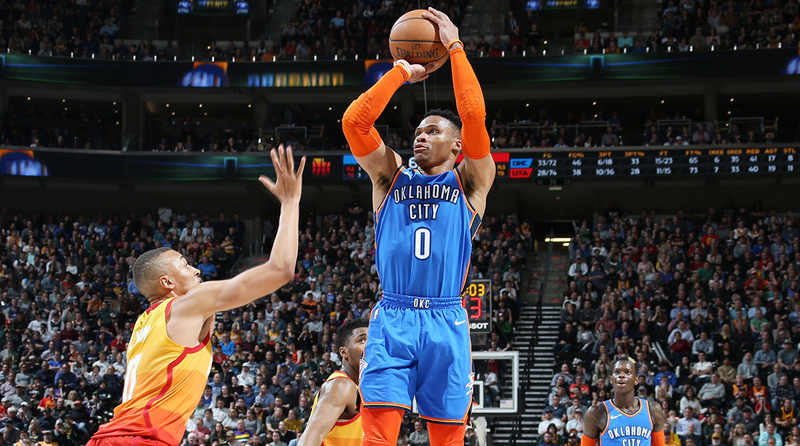 Brodie’s defenders would argue his 46-points, 43-shot performance was a necessary evil, born out of a shrinking supporting cast. The narrative belies the reality. Westbrook’s shot selection became increasingly erratic in the fourth quarter in Utah, defined by 12 missed threes, six in the fourth. Westbrook and George were bested by a rookie and Joe Ingles, faced with a necessary adaptation to compete in the West. Westbrook’s ball-dominant tendencies are worthwhile without a second star. Next to George, though, they’re unnecessary, and ultimately destructive. There’s a path for Oklahoma City to pass Houston and Denver for second in the West hierarchy. Competing with Golden State isn’t out of the question either, though it would take a true Warriors collapse for the Thunder to reach the Finals. Still, Oklahoma City is now a more refined product compared last year’s stagnant crew, aided by Westbrook’s stylistic adjustments. Westbrook won’t ever be mistaken for a Splash Brother. But with restrained shot selection and a passable percentage, Oklahoma City’s leading man can keep the Thunder firmly entrenched in the race for the Western Conference crown.